Please join us for a great debate on the upcoming mid-terms: “A Blue Wave? 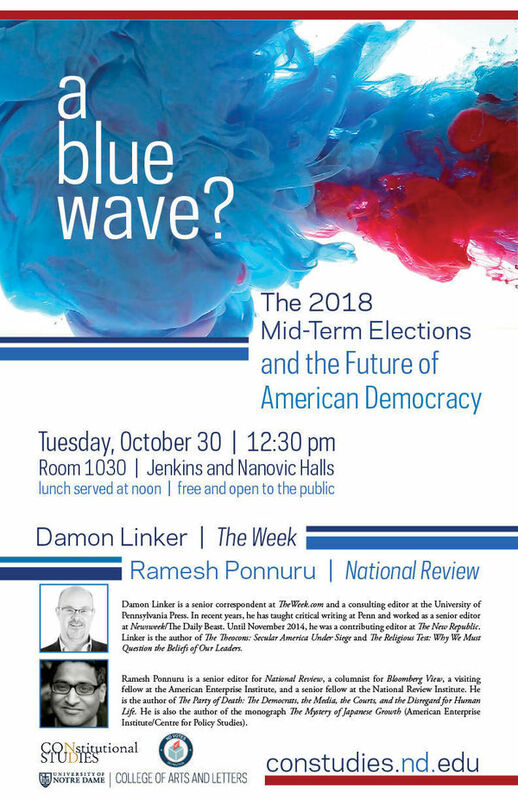 The 2018 Mid-Term Elections and the Future of American Democracy” takes place on Tuesday, October 30, with Damon Linker of The Week, and Ramesh Ponnuru of National Review. Damon Linker is a senior correspondent at TheWeek.com and a consulting editor at the University of Pennsylvania Press. In recent years, he has taught critical writing at Penn and worked as a senior editor at Newsweek/​The Daily Beast. Until November 2014, he was a contributing editor at The New Republic. Linker is the author of The Theocons: Secular America Under Siege and The Religious Test: Why We Must Question the Beliefs of Our Leaders. Ramesh Ponnuru is a senior editor for National Review, a columnist for Bloomberg View, a visiting fellow at the American Enterprise Institute, and a senior fellow at the National Review Institute. He is the author of The Party of Death: The Democrats, the Media, the Courts, and the Disregard for Human Life. He is also the author of the monograph The Mystery of Japanese Growth (American Enterprise Institute/Centre for Policy Studies).